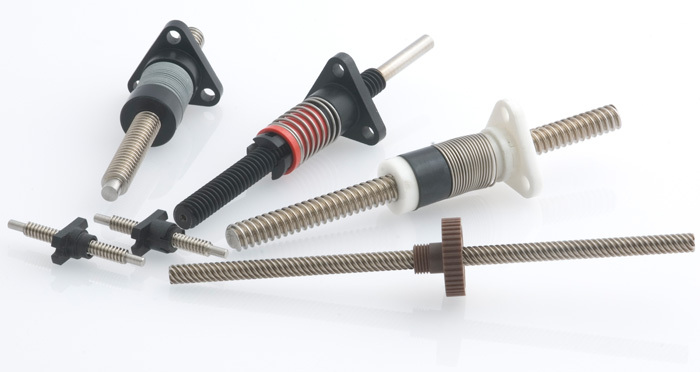 Reliance Precision supplies a wide selection of leadscrew and nut assemblies. Rolled from a non-magnetic premium grade 303 stainless steel as well as available in alternative material options, 316 and 400 series stainless steel to precipitation hardening steels, aluminium and titanium. These leadscrew materials are ideally suited for industries such as medical, vacuum, cleanroom, food and human contact as well as in salt spray or cryogenics. Leadscrew standard diameters from 3.2mm to 24mm and standard leads from 0.30mm to 92mm including imperial sizes are available. Innovative anti-backlash nut designs using self-lubricating polymers provide assemblies which compensate for wear with low frictional drag torques and excellent positional repeatability. Positional bi-directional repeatability with an anti-backlash nut is generally around 1.5micron, standard lead accuracy is better than 0.0006mm/mm. Due to the controlled manufacturing processes, different types of plastics that can be moulded, including PEEK, special carbon or other fibre filled plastic. Even though the standard design and materials developed for the leadscrew nut assemblies are commonly plastics. All standard leadscrew nuts are manufactured from self-lubricating plastics. When the best performance is required, a standard soft and hard TFE coating which is available to provide the ultimate result in the most demanding applications. These TFE coatings supply the best distribution of lubricant in our assemblies. Reliance can also supply leadscrews with specialist Nickel/TFE coatings and offers support with the choice of coatings used in medium vacuum applications (up to 10-5). The BFE coating is a special proprietary hard coating which shares many of the benefits of TFE coating but offers exceptional durability in more aggressive environments and where reduced friction and a permanent coating is desired. In addition to the standard nut types, modified and complete custom configurations are available. Modifications may be simple changes such as different mounting hole patterns or mounting threads, small dimensional changes or special materials including bronze, brass or stainless steel. In order to be able to achieve both the most technically and cost effective solution, we are able to supply special moulded nuts with impregnated metal for strength, thus minimizing the number of components in the assembly. Using custom moulds and special machining, nuts can also include guide bushings, carriages, timing pulleys, gears, syringe components, sensor mounts and flags, encoder features, clamps and many other complementary elements including quick release mounts, partial thread engagement, half nut construction or special shapes and geometries. Special materials are offered to extend the performance of our assemblies. Materials can be chosen for extreme temperature, chemical compatibility, autoclaving, agency approvals, special loadings and many other specific requirements. ­­­For more information on the full range of positioning components and assemblies, please contact us.